« New Bike Parking Regs for the Win! Everyone who wants to bike should be able to because biking can make us happier, keep us healthier, save us money, and reduce climate pollution. That’s why we’re advocating to build a connected network of safe and comfortable streets for people biking. 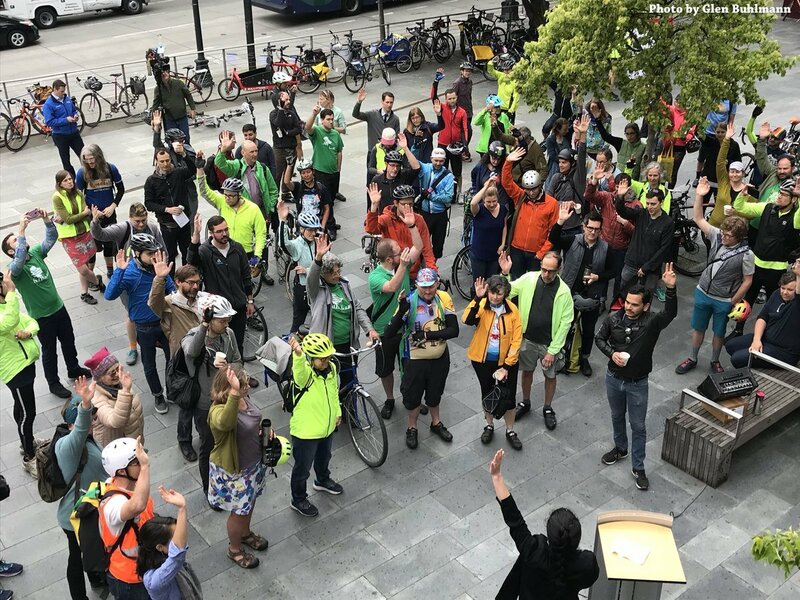 At 8:00am on the morning of Bike Everywhere Day, we took this message to the street by forming Seattle’s first people-protected bike lane in front of City Hall on 4th Avenue. 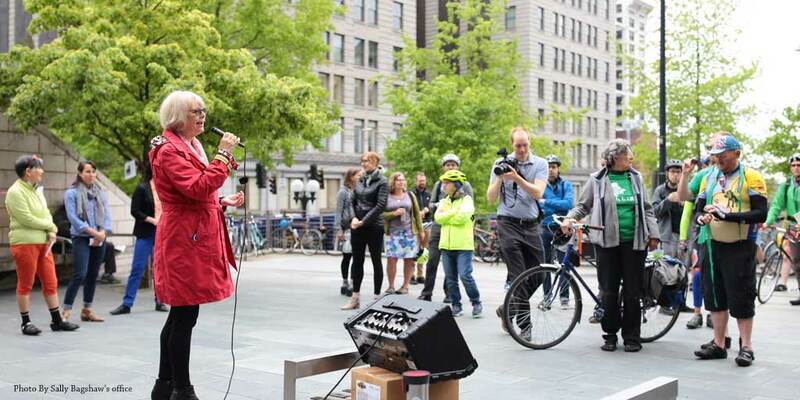 The hugely successful free speech action and the rally that followed demonstrated the joy and safety that protected bike lanes can bring to our streets. Standing side by side, we created a colorful human barrier between people riding bicycles and car traffic. 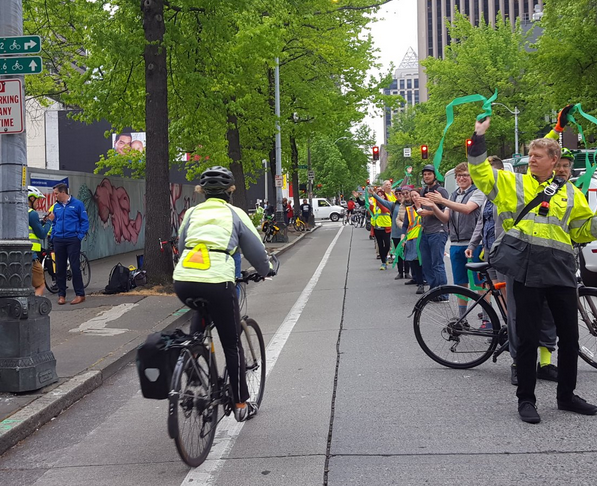 Five group rides from around the city (Beacon Hill, Columbia City, Fremont, Ravenna, and West Seattle) joined people on their regular commuting route and converged at the people-protected bike lane amidst a positive fanfare of cheering, high fives, and waving streamers. The mood turned more somber when Clara asked the crowd to “raise your hand if you have been involved in a crash or close call in the last month” and every hand in the audience went up, including Councilmember Rob Johnson’s. 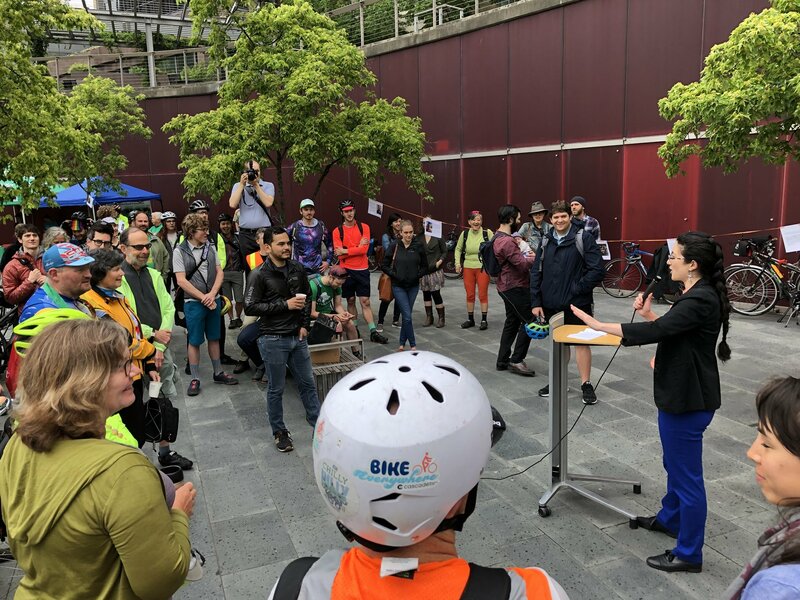 We know that safety is a major barrier — sixty percent of the population in Seattle wants to bike more, and dangerous streets is the number one reason they choose not to. But the Basic Bike Network, which would build safe and comfortable bike connections to get people where they need to go in and around the center city, has been delayed again and again — see this story for background information. We also know that when you build connected bike routes, people will come in droves. Around the world, cities like Vancouver, Calgary, New York and London have all implemented connected bike networks, and have seen ridership explode. 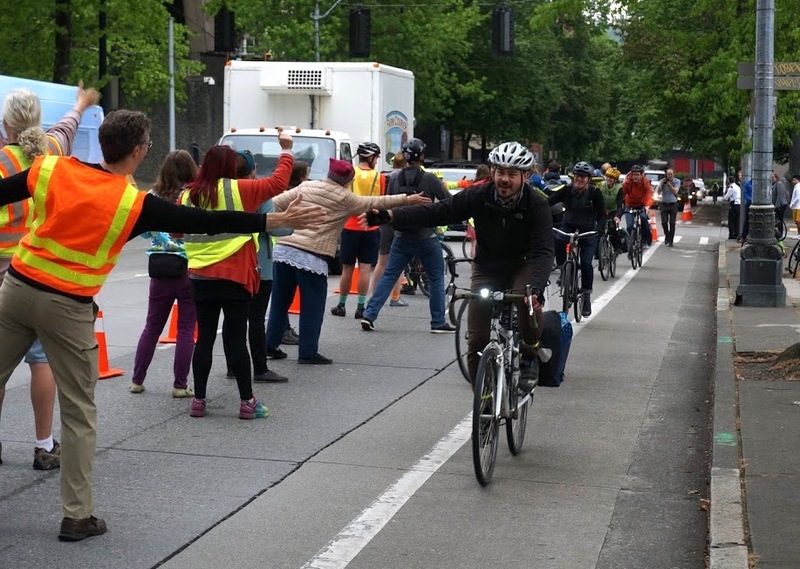 Even here in Seattle, bike ridership jumped 30% on 2nd Ave when the protected bike lanes there were connected to an incomplete route on Pike and Pine. Every connection matters and makes the network more useful. 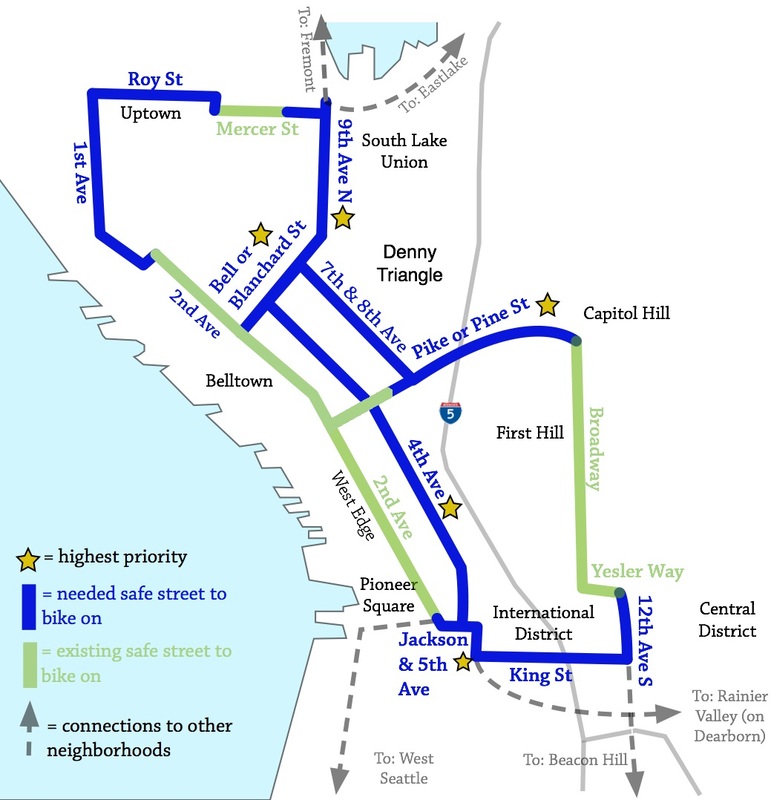 In fact, the City of Seattle expects that ridership will double with the completion of the Basic Bike network. That’s why we’re asking the City of Seattle to #BuildItNow! And as a people-powered movement we can’t win these improvements without you. 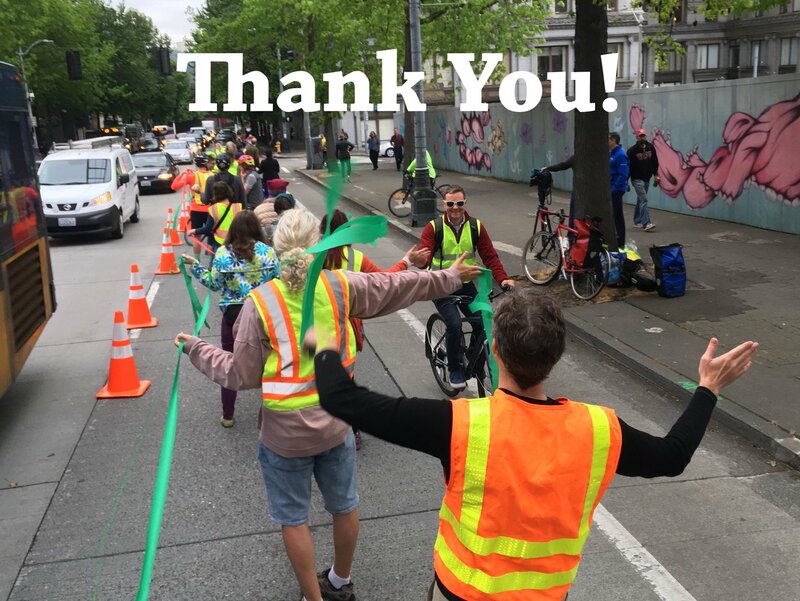 A big high five to everyone who showed up and took part in the people protected bike lane or the ride and rally today, and to all the volunteers who helped us make signs, carry supplies in their cargo bikes, spread the word, or otherwise supported us to make this event a success. Email your elected leaders letting them know we need to build to the Basic Bike Network! Become a monthly donor.Your gift allows us to fight for safe places to bike for people of all ages and abilities. Share a photo of yourself along with a quote about why a basic bike network is important to you. Check out our inspiring album on Facebook and share your own story with tags #basicbikenetwork, #wecantwait, and #seattlegreenways. Ride your bike & bring a friend! There is safety in numbers – research has shown the more people who ride their bikes, the safer everyone is. May is a great time to encourage a friend, colleague, or family member to try biking in Seattle. You are making a difference and together we will build a city that reflects our common needs and shared values by making every neighborhood a great place to walk, bike, and live.